Much like Russell Pearce in Arizona, Alabama state senator Scott Beason has made anti-immigration rhetoric his political agenda. GARDENDALE, Ala. — Newspaper editorials have called him treasonous. The N.A.A.C.P. has called for his resignation. Chamber of commerce groups and civil libertarians have found common cause in disgruntlement, and a Republican sheriff more or less accused him of being an accessory to any deaths that take place in his county. 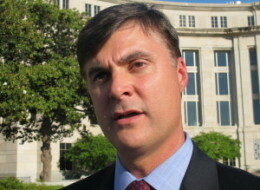 Scott Beason, a Republican state senator from Alabama, at an immigration reform rally in Montgomery, Ala., in March. After Senator Beason blocked a tax bill, residents of his home county had to wait hours to handle services like licenses and tags. Despite that list of critics (and quite a few more), a lot of Alabamians love Scott Beason, a 41-year-old Republican state senator who is the state’s foremost champion of conservative populism. His majority-of-one approach in the Legislature is popular among his supporters, but as recent weeks have shown, it can leave a person pretty exposed: outside of college football, Mr. Beason has become just about the most divisive topic in Alabama. Protest marches and lawsuits are still dominating headlines after the passage of the strictest and most far-reaching immigration bill in the country, of which Mr. Beason was the Senate sponsor. Mr. Beason was also right in the middle of the debate over Jefferson County, home of the city of Birmingham and one of the biggest fiscal crises in the country. Though several state lawmakers blocked or voted down plans to help the county when it suddenly faced a steep dropoff in revenue — a lack of action that has led to hundreds of layoffs and steep cuts in services — the crisis has largely been pinned on Mr. Beason, who singlehandedly scuttled the county’s last effort at a financial contingency plan. And then there is Mr. Beason’s leading role in the blockbuster public corruption trial unfolding this summer in Montgomery. As part of a federal investigation into accusations that casino operators tried to buy lawmakers’ votes for a gambling bill, Mr. Beason wore a concealed recording device throughout the spring of 2010. And on those recordings, it was revealed in court, Mr. Beason disparages fellow Republicans and has some derogatory conversations about blacks, whom he at one point refers to as “aborigines.” It left an impressively bipartisan trail of bad blood. Mr. Beason does not come off, in conversation, as a bomb thrower. In a phone interview from Florida, where he and his family are on vacation, he said he was surprised by the intensity of the recent attention. Though he said he could not comment on the trial, he attributed a lot of the rancor to people who have misconstrued his statements or positions, intentionally in some cases. The positions themselves he is not apologizing for. “I don’t mind standing up against anybody on my principles and my beliefs,” he said. This may sound rather grand, but even his political opponents acknowledge that Mr. Beason is sincere. His opponents also grant that Mr. Beason, who has a reputation as a dogged campaigner, truly represents the politics of his district, part of which lies here in the Birmingham suburbs of northern Jefferson County. The district is for the most part white, middle-class and deeply conservative. Patriotism and social issues like abortion are more important to the voters here than Republican leaders often realize, said Mr. Beason, and special tax breaks for corporations are just as aggravating to them as government programs for the poor. “I don’t think that they necessarily understand that the majority of our voters care about big issues,” he said of his party, which he has been bucking for as long as he has pursued a career in politics. In 1994, just a few years out of college, Mr. Beason ran for State Senate, challenging a Republican veteran. He lost. He might be correct- African American isn’t Africans.